Peter McTaggart (1732-post 1825) was born in Galloway, Wigtownshire, Scotland. He married Martha (1734-) in Scotland in 1752, and had a son James McTaggart (1754-1843). They immigrated to the British North American colonies sometime after the birth of their son James, but before 1761. By 1761 they settled at Boston, Massachusetts, where he worked as a merchant. Fig. 1. Boston Gazette and Country Journal, Monday, June 22, 1761. (Dow 39) We do not know what other numismatic wares McTaggart had to sell. He is certainly to be counted among the earliest known merchants in North America to sell medals at retail or any numismatic items for that matter. 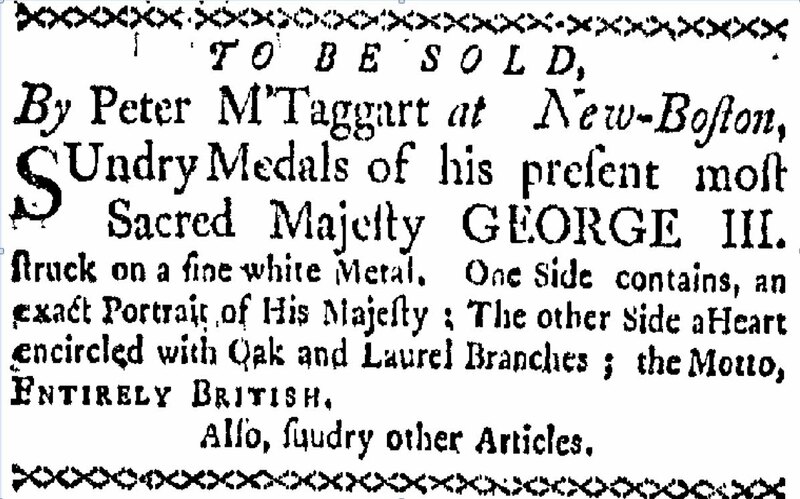 In June 1761 we find him advertising in the Boston Gazette and Country Journal, the sale of “Sundry Medals of his present most Sacred Majesty GEORGE III, struck on a fine white Metal. One side contains, an exact portrait of His Majesty : The other Side a Heart encircled with Oak and Laurel Branches : the Motto, ENTIRELY BRITISH.” Note his address is given as New-Boston, which was the "West-end of town". Three months earlier, from March 17-20, 1760, the "Great Fire" at Boston's "West-end" called "New-Boston" began at a joiner's shop and spread due to strong winds, which eventually destroyed 349 buildings. Despite the difficulties many suffered at "New-Boston" the medal honoring the new King was something so desirable that McTaggart highlighted its sale so that all of his other goods and wares were relegated to a footnote in his advertisement "Also, sundry other Articles." One wonders if these "other Articles" were also exclusively numismatic. The odds of that are unlikely considering the historical milieu and were most probably an assortment of household goods, foodstuffs, or various materials, fabrics, metal goods, and so forth. The political gist of the advertisement shows strong support for the Royal Crown as did the governor Thomas Pownall, who resigned just 19 days before this advertisement was published. John Adams called Pownall "the most constitutional and national Governor." The new governor, Sir Francis Bernard, did not step in until the following month on August 2, 1760. He was soon met with great opposition caused by his totalitarianism style of government. But, here during this advertisement and campaign to sell medals in honor of the new King we would find McTaggart quite successful in selling out whatever supply he had on hand. There is neither information about the quantity of medals McTaggart had on stock nor the prices he sold them at. Fine white metal specimens of the George III accession medal are not known to this writer. Those in bronze and silver are well documented. These were accession to the Royal Throne medals struck, and most probably continued to be dispersed early in his reign prior to his marriage and coronation in September the following year, or for about three months after this advertisement. The illustration below taken from The Numismatist is the accession medal incompletely described by McTaggart in his advertisement omitting mention of the plinth block and its inscription. The phrase "Entirely British," mimics that of the March 8, 1702 Accession Medal Queen Anne (1665-1714) "Entirely English" designed by John Croker and its copy made by Christian Wermuth. Also, the heart encircled by oak and olive branches is found on the reverse of Queen Anne's Accession medal. However, that heart has the Royal Crown above it and the encircling branches are far more elaborate, elegant and beautifully designed than those we find poorly imitated in the George III accession medal. The plinth block on Queen Anne's Accession Medal bears the inscription ATAVIS REGIEVS (from Ancient Royalty) is entirely changed in the George III medal which emphasizes his birth hoping the fact he was born in London could persuade he too is English. The iconography for this heart emblema of Queen Anne is found in her parliamentary speech, "As I know my heart to be entirely English, I can very sincerely assure you there is not anything you can expect or desire from me which I shall not be ready to do for the happiness and prosperity of England." But, of course, young George III, though born in London was German in blood. The propaganda to promote him as English began when he was a boy at age 10. He took part in a family production of Joseph Addison's play Cato and said in the new prologue: "What, tho' a boy! It may with truth be said, A boy in England born, in England bred". Like Anne before him George III wished that all the English understood his heart completely belonged to England. Consequently, he borrowed heavily from her accession medal to promote himself as thoroughly British. 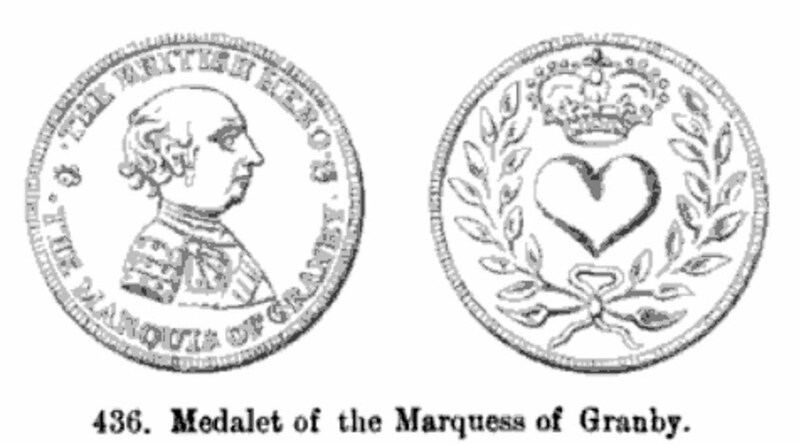 Besides the iconography of Queen Anne's medal the designer also seems to have borrowed from the medalet of the Marquis of Granby with the bust portrait on the obverse and heart encircled with a wreath on the reverse. This medalet was struck to commemorate the valor of the Marquis at the Battle of Minden. Using a similar design the anticipated result would be an association persuading the English that young George also has a heart of valor for England. Fig. 2. The Medalet of the Marquess of Granby for his valor at the Battle of Minden 1759. LEGEND: THE BRITISH HERO/ THE MARQUIS OF GRANBY. Note the reverse with the heart with a crown encircled by a wreath of two branches tied by a ribbon. Illustration in Edward Hawkins, Augustus W. Franks and Herbert Appold Grueber, Medallic Illustrations of the History of Great Britain and Ireland to the Death of George II. (London, 1885) Vol. II : 704, fig. 436. For the Queen Anne Accession Medal see numbers 1 and 2, page 227. Fig. 3. 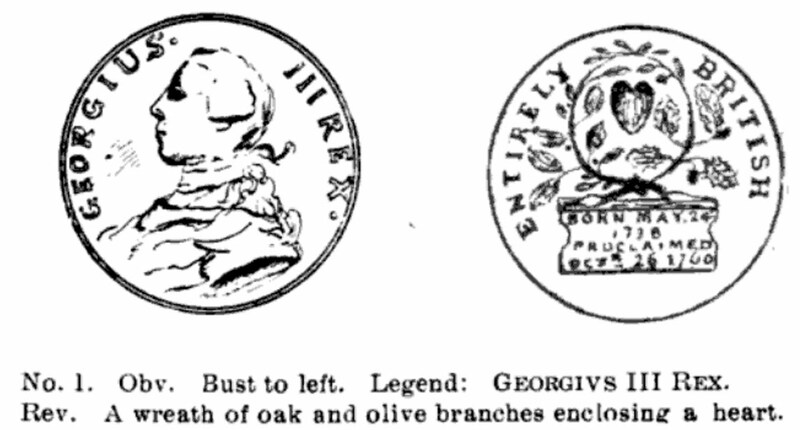 Illustration in The Numismatist, Vol. XVI, No. 9, September (1903) : 262. This is the accession medal bearing the inscription proclaiming George III king. The engraver at the British Mint of Italian descent, Thomas Pingo (1714-1776), designed the Accession Medals in silver and bronze. The heart within a wreath of laurel and oak rests on a plinth block bearing the 4-line inscription BORN MAY 24/1738/PROCLAIMED/OCTR. 26 1760. George III (1738-1820), ascended the throne of England on October 22, 1760 and crowned September 22, 1761, two weeks after his wedding to Charlotte Sophia of Mecklenburg-Strelitz. In 1790, according to the U. S. Census McTaggart moved to York Township, York County, Pennsylvania. He appears to have left the United States before 1800. He may be the same as the Peter McTaggart listed in the 1825 Census of Quebec, Quebec, Canada together with his son (James) and a daughter. He died in Sophiasburgh Township, Prince Edward County, Ontario, Canada. Special thanks to Joel Orosz who reviewed and offered valuable suggestions and corrections to this article which were duly made before Wayne Homren ran his version in E-Sylum. John Adams, The Works of John Adams. (Boston: Little, Brown, 1856) Volume 10 : 243 .